I've been working like crazy on this quilt trying to get it done on time. I'm going to be late. There is always something going on that seems to prevent me from getting to it and there are times I just need a break from it. I've been machine quilting it and I'm about half-way done. 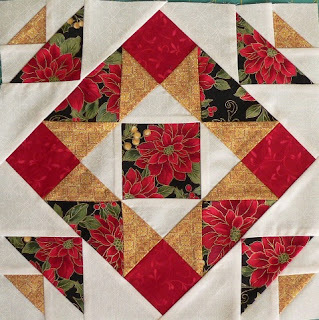 I need to finish 8 blocks and the outer poinsettia border. It really is lovely. Once I get the binding on, I'll post some pictures. I know I'll be done next week, but the pictures may not get posted. I still have Christmas cards to make. I'm working on a quilt for my mother for her birthday in December. It is a special year because she will be turning 70. I wanted to give her something special and living far away, it is a hard to make it a special day in person. She is down-sizing planning to sell her house and move to another state in the next few years. I decided to make her a quilt. My mother knows I'm making a lot of quilts for Christmas this year, perhaps she speculates that she will be receiving one. What cracked me up in one conversation was she asked if I had started my Christmas cards yet. Nope. While I need to be sewing 40-60 hours a week to be done by Thanksgiving, I haven't figured in time for the stamping that needs to happen. Somehow, I didn't budget in enough time for Scouting either. 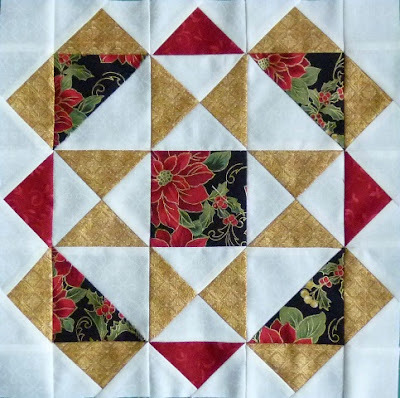 The poinsettia and gold material is quite elegant in person. There is a sheen to it with the gold thread that outlines the leaves/flowers and the print of the gold material. It really is lovely. I count myself very fortunate that I have a high tolerance of pain. I have to admit, I have wondered if that is a bad thing. I had surgery on Tuesday. I was told that my pain would probably be around a 5 or 6, if it reached a 7 or higher, they would give me pain medicine. I don't even think it was a 1. I got home around 6:00, my aunt called within minutes. We talked for a while and then my son drove me to a meeting. The funny part is when I talked with my aunt she mentioned she was going to send flowers but I didn't sound bad at all. I told her to hang up and call me back and I'd do better at not sounding so good. She laughed, as did I when I came home from my son's doctor appointment and saw flowers by the door. My biggest pain from the procedure was from the IV they put in. It left a nasty bruise on my arm (2" x 1-7/8"). Ouch! I've been so busy on another quilt that I put off working on this block. I think I may have procrastinated on it because I wasn't looking forward to the doubling the triangle to get the 4 diamonds. I should have pressed my seams open for it to lay better. I managed to get it done in time for the Saturday Sampler. I just experienced one of those needed do-over moments. 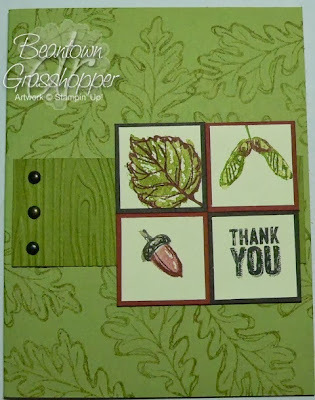 I made the card below first, recalling measurements but not the direction the card was supposed to be going. I had to adjust the Old Olive CS, because that measurement seemed small. I went to link up to the sketch and discovered my error. I was going to go with it because it is late, I'm tired and there are dishes to do. I couldn't do it. I tried but I couldn't post it today of all days. The above card is my do-over. I like it. I'm going to do the dishes and go to bed. We've got 4 girls sleeping over but I will sleep through their laughs and chatter. Enjoy! I used Sketch 175 to make this card. Click the image below to continue. The above card is unknown. I need a do-over on this card. I like it but I'm not too hot on my paper choice. Perhaps if I switched the sides on the DP it would look better. I like the fold and that the tag is secured behind the snowflake, which keeps is closed. 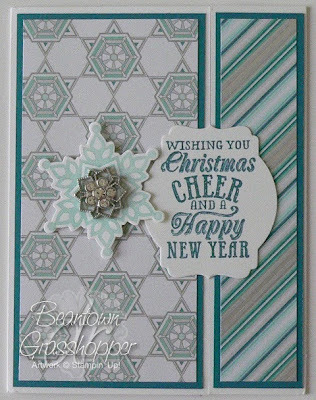 I like the Frosted Finishes embellishment. I'm having trouble with thinking of it as a Christmas card because of the color and I'm not fond of the DP on the left. Stamps: Festive Flurry, Christmas Messages Ink: Island Indigo CS: Winter Frost DP, WW, Island Indigo Misc. 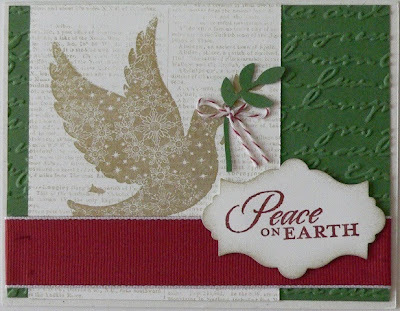 : Deco Labels and Festive Furry Framelits, Frosted Finishes embellishments, dimensionals, glue dots. This is not my favorite square. It was easy to cut the pieces for the square, rather fast in fact. The shop substituted one of the fabrics and it really would have looked better with the original fabric they had chosen. The blue that is a shade darker on the "star" (upper right/lower left) is the same design as their original choice but it is a lighter shade of blue. I think it needs to be darker because of the blue diagonal line going through and simply for contrast within the star. 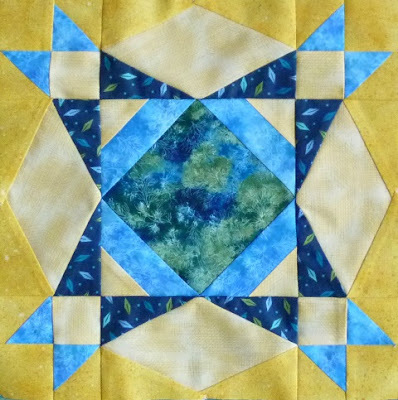 I'm going to ask when I go if I can buy a kit for this block and then I'll substitute it with my own fabric (if I have any of the original fabric they chose). I need to check my stash before I go buying it. Today was one of those Sundays when the those that are somehow tied to Primary (i.e., teachers, nursery leaders, cub scouts, activity days, etc.) got a little something to thank them for all they do. I try to do something every month. Some months my "gift" is spendy and some months it isn't. This is one of those months that ran pretty cheap for me. 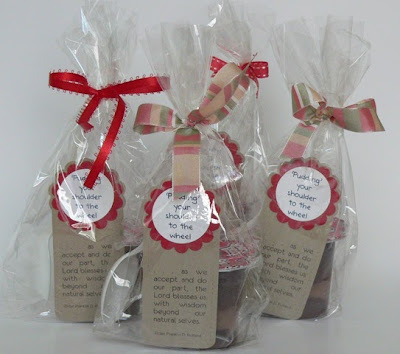 I already had the cellophane bags, cardstock and ribbon so I only needed to buy the pudding and spoons. The pudding was on sale = BONUS!! I put together 36 bags for $8. We have a song in our hymn book called Put Your Shoulder to the Wheel. I found this to be a fun play on that. The idea came from Pinterest with a tag ready made that you could print, which I didn't use. I wanted it to look a little more snazzy. I typed the quote and printed it on Crumb Cake cardstock and whisper white for the circle portion of the tag. I used the Two Tags die, scallop punch, and 1-3/8 circle punch to make the tag. I had the opportunity to host a swap for VC Rocks this summer. My swap was gift card holders. I was excited to get some ideas hosting this swap. I'm known to buy a gift card and toss it inside the card, put it in the envelope, seal it and call it good. This top holder is one of my favorites from the swap. Anita Watson started with a base of a full-sized card (4-1/4x5-1/2). In the center upper half of the right side on top, she used a circle punch, cutting half of a circle. She then folded the top part of the card in half. You can see that there is a flap in the picture where the Calypso Coral CS is. This is where the gift card is held. The 1/2 circle punch makes for easy access to the gift card. Beverly Williams made this gift card holder. The Summer Sun CS slides out and holds the gift card. Sue-Lynn Bock showed a creative way to use the petal punch!